Did you know, we spend a third of our lives sleeping, and the average person sweats out around half a pint of perspiration each night? Yet despite everything that our mattresses go through, the majority of us neglect to clean them as often as we should. The summer months are upon us, so it’s a great time to blow away the winter cobwebs and give your mattress some TLC! Dust mites simply love the diet of dust and dead skin cells that they can feed off each night in your bed. One of the best ways to get rid of dust mites is to vacuum them, and their food of choice, away. Vacuuming your mattress every couple of months should be enough to remove most of the dirt and debris that can accumulate there. All the sweat and debris that your mattress accumulates can start to whiff a bit if you’re not careful. Before you vacuum your mattress, give it a healthy sprinkling of bicarbonate of soda, using a sieve to spread it evenly all over. It will help to neutralise any odours and draw moisture out of the mattress. Leave the bicarbonate of soda for an hour or so before vacuuming it all away. Stains come in three varieties: protein, tannin, and grease; but the main one that usually ends up on your mattress is a protein stain. This includes things like sweat, blood, urine, vomit, and other bodily fluids. Whatever the stain, it’s always best to tend to it as soon as possible to avoid it setting in. Liquid stains should be blotted up with a cool, damp cloth, followed by a dry cloth to absorb excess moisture. Use a pressing motion rather than a circular motion to avoid rubbing it in further. It’s important to remember that heat sets protein stains so use cold water when handling them. A fresh protein stain can be removed with a paste made from salt, bicarbonate of soda, and water. Rub it into the stained area, allow to dry, then brush away before using cool water to remove the excess paste. It’s important to remember that mattresses do not like water so always use it very sparingly when removing stains. Cleaning methods such as steam cleaning should also be avoided or left to the professionals. Steam cleaning can leave too much water in your mattress, allowing bacteria and mildew to breed. 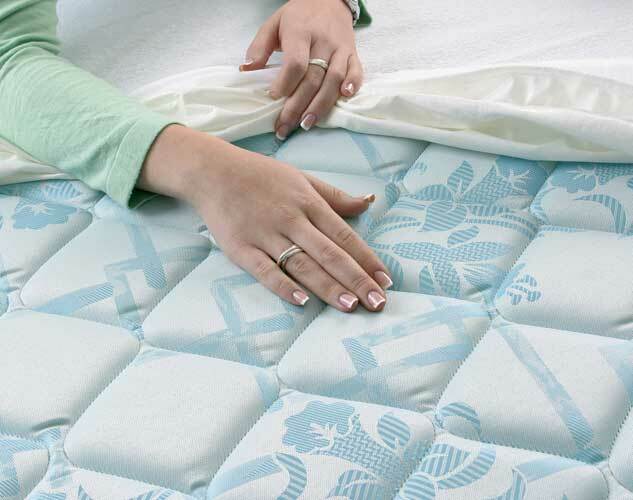 Using a mattress protector can go some way to protecting your mattress from stains. They are easy to fit and remove, and most importantly they’re washable! You’ll usually find that a mattress protector will add an extra layer of comfort to your bed too, which is always a bonus.